The actual date is contentious, but the Walkers Brothers did bid adieu to fans in May 1967. Scott Walker (born Noel Scott Engel in Ohio on the 9th January 1944), John Walker (b. John Maus, New York, 12 Nov. 1943) and Gary Walker (b. Gary Leeds, 3. Sept 1944 in Glendale, CA). Leeds – an ex-memebr of The Standells, met Engel (former bassist of Routers) and Maus while they were performing with The Dalton Brothers. The three formed the Walker Brothers and after a dodgy start in the US, they moved to England where they were taken under the wing of manager Maurice King. 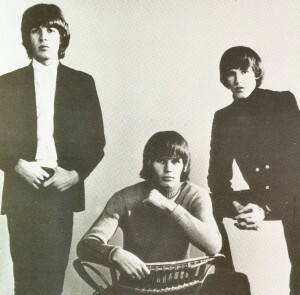 Maus had debuted as lead vocalist with Pretty Girls Everywhere, but it was Scott Engel’s voice – that can still melt bricks in my opinion, which shot them in the top 20 with Love Her in May 1965. Right place, right time, helped the Walker Brothers fill Phil Spectres Righteous Brothers shoes as they had enjoyed the success and were now starting to fall in the UK charts. Hits like ‘Make It Easy On Yourself’, ‘The Sun Ain’t Gonna Shine Anymore‘ followed, but friction in the Walker camp between Maus and Engel was starting to smoke – and the second solo EP ‘Solo Scott, Solo John’ in 1967 signalled their intentions to split. Their flirt with fame as a trio turned to tragic love affair . They attempted to weaken their decline between 1965 and ’67 with tracks like ‘You Don’t Have To Tell Me‘, ‘Another Tear‘, ‘Stay With Me Baby‘ and the film theme tune from’ Deadlier Tan The Male‘ – a James Bond spin-off with a great title, 1967. And the final nail in the coffin came with the farewell song ‘Walking In The Rain‘ – with a diluted review from Musical Express, titled; ‘Walkers Last Not Great’. Gary Leeds went on to form his own group, Gary Walker and The Rain, in the autumn of 1967. Maus went onto a solo career and wrote songs like ‘Annabella‘ with Graham Nash that received chart success. Scott Engel started taking another route – partying antics with play boy bunnys lead to the music of Jacque Brel and Engel was hooked. He covered 3 songs by Brel, including Jacky, on his first solo album ‘Scott’. Well, you can’t keep a good man band down and the Walkers walked back on the scene in 1975 with their comeback album ‘No Regrets‘. The follow-up ‘Lines‘ was similar to it’s predecessor but their Swansong Album ‘Nite Flights‘ took on a brave experimental flavour, one which would become better known in Scott Engels future solo work. Walker Brothers Discography: Take It Easy With The Walker Brothers (1965), Portrait (1966), Images (1967), No Regrets (1975), Lines (1977), Nite Flights (1978), The Walkers Brothers In Japan (1987, rec. 1968). Compilations: After The Lights Go Out- Best Of 1965-1967 (1990), No Regrets – The Best Of The Walker Brothers (1991). This is just my small way of paying respects to a band I loved as a teenager – born the year they split I can only commemorate a past I’d like to have witnessed. I’ve made a playlist of the tracks I love of theirs, and a couple of others from artists whole played a role in the Walker Brothers lives and vice versa. The Old Man is Back Again has been left out (see post Track of the Day, 27.03.13 ). David Bowie covers My Death (Scott Walker) in 1973. Tom Rush’s original version of ‘No Regrets‘ takes on a lighter, resignated sadness to the high drama of the Walker Brothers. Engel suffered from chronic nightmares which influenced a lot of his solo work. Rawhide could be one them? The Electrician – a political epitaph, written about N. America sending people to train torture in South America. Neko Case covers Engels ‘Duchess‘ in 1997, originally rec. 1969.